The Tabernacle was surrounded by a yard, or “Court” (Exodus 27:9-19), toward the rear of which it stood, and this courtyard is referred to by the Bible translators, as the “holy place” — see Leviticus 6:26 and 14:13. The world during the Millennium Age (Messianic 1000 year reign of Christ with the Church — the 144,000 Elect Bride of Christ members). The same is shown in the time in the ark (which pictures redemption) — a total of 381 days, which is 3 x 127, that is, three times the age of Sarah, who represents the Abrahamic Covenant. Also in the three times the doves were sent out from the ark in Genesis chapter 8 — three missions of the holy Spirit. And again in the three stories or levels of the ark, thus three time periods of justification. Who Could Enter the Court? Note: Northward is the direction of God, and the Heavenly Realm. Offering on the north side of the altar emphasizes that the offering is made to God. The offerers (Israelites) represent believers, coming in faith to make an offering to God — whether believers in this age, or in the next. Israelites commonly came in to make offerings. But the “daily sacrifice” was one lamb in the morning, another in the late afternoon, and these were done by the priests (Exodus 29:38-39). The daily sacrifice was a burnt offering and it represents the ransom sacrifice of Jesus, who fulfilled this type, thus causing it to cease. The morning and evening times correlate with Jesus being put on the cross in the morning and expiring in the afternoon. The Apostle Paul explained that our sacrifice is not just to be twice a day but 24/7 hence he defined the consecrated ones of this Gospel Age of the “High Calling” into Christ, as “living sacrifices” who “are holy acceptable unto God, which is your reasonable service” (Romans 12:1). In the Court, the metal used most often was copper. Copper represents human nature, either justified or perfect. In John 3:14, Jesus compares himself to the copper serpent lifted up in the wilderness in the days of Moses, which healed those who looked to it. The copper of that serpent represents the perfect humanity of Jesus. The serpent symbol is used to represent that Jesus takes the burden of our sins upon himself, thus curing us from the “snakebite” of sin. The court contained the “brazen altar” for use by the priests. Possibly Levites assisted the priests in some ways respecting the sacrifices (other than putting it on the altar). The court was 50 cubits wide and 100 cubits long — thus three of them could fit into the floor plan of Noah’s Ark, which was 50 cubits wide and 300 cubits long (Genesis 6:15). This also suggests that there are three time periods in God’s Plan (as explained at the start of this Tabernacle Study No. 4) where justified persons are called of God. It is notable that the “house of the forest”, picturing the call of the world during the Millennium, was also the size of the court (1 Kings 7:2). The court was formed by a fence of white linen curtains (see Study 9 on this website in the series “Beauties of the Tabernacle,” titled “The Gate. The Door. The Veil”, suspended from silver hooks, set in the tops of wooden posts 5 cubits (7 1/2 feet high), which were set in heavy sockets of copper (mistranslated brass), and braced, like the tent which covered the Tabernacle, with cords and pins. The silver hooks in the courtyard posts by which the posts held up the curtain, represent the divine Truth, by the knowledge of which the justified believer holds on to the righteousness of Christ. Silver is a general symbol of Truth but perhaps more specifically, that TRUTH which centers and deals with the RANSOM — the redemption accomplished in Christ Jesus (Tabernacle Shadows, page 114). As these hooks were small in size they represent the small amount of Truth necessary to justify one. “. . . [God] enjoined that, whenever Israel was numbered as His people, every man must give a ransom for his soul. The price was fixed by God Himself. Hence, since most of the silver used in the Tabernacle was for the 100 foundation sockets for the Tabernacle Proper, this beautifully points to the TRUTH relative to the RANSOM sacrifice of our Lord as the foundation Truth upon which the entire plan of God rests. “The four gold-plated pillars (posts) at the entrance of the Most Holy supporting the (second) Vail stood in four SILVER sockets, (reality, truth, verity) seeming to say to us, when you come inside this vail, you will be perfect – really and truly new creatures” (Tabernacle Shadows, page 115). The posts of the Court (Exodus 27:10-17) represent the justified believers whose imperfections are covered by Christ’s righteousness. The function of the posts is to hold up to public view one’s faith in Christ who is represented by the linen curtain. This, brethren, is our purpose for being. This is why we are here. To show forth the mercy and goodness of Christ’s redemptive work, as Paul says, “in the midst of a crooked and perverse generation among whom ye shine as lights in the world” (Philippians 2:15). The posts were made of wood which is a corruptible material thus implying that the class typified, are not actually perfect as human beings. The posts were set in sockets of copper which were sunken in the sand for stability. Some use the term “tentative justification,” to describe a Christian in the court condition before they reach the point of consecration at the door of the Tabernacle. However the priests also served in the court, and the priests represent the fully consecrated/spirit begotten. So their justification is also indicated in the court. If we simply relate that the court represents justification through faith in Christ, perhaps this suffices. It need not be one way or another — only unconsecrated (not spirit begotten) believers or only consecrated (spirit begotten) believers — as the concept of being justified by one’s faith in Christ can pertain to believers before consecration or believers after consecration. Thanks to being reckoned as righteous in God’s sight, we are judged as to faithfulness in our intentions rather than in our actions. “For if there be first a willing mind, it is accepted according to that a man hath, and not according to that he hath not” (2 Corinthians 8:12). Now, with rejoicing we can say with the Apostle Paul, “I can do all things through Christ which strengtheneth me” (Philippians 4:13). There is more to the philosophy of the ransom that prevents our faith from becoming weak and unstable. This is shown in the system of guy lines which uphold the wall of the court and tie the posts to the ground. These cords represented the things which tie the justified believer to the earth; and there were two sets of cords and pins, one set inside the Court, the other, outside. The set outside of the Court, outside of the justified state, represented the sin in the flesh which ties the believer to the world. The set inside the Court represented the earthly things: joys, studies, music, etc., right enough in themselves, which bind the believer to the world. These are the weights (Hebrews 12:1). These ropes were anchored by copper pegs — tent pegs. One of these was installed inside the court and the other on the outside. Being copper, as opposed to wood covered with copper, they showed actual human perfection. As we scan the pages of history we see just two — and no more — perfect men: Adam and Jesus. We see the one who lost his standing in the court, Adam, as the peg driven outside the fence. The other, grounded firmly in the court, pictures Jesus. These two have one connection — the ransom — pictured by this cord even as it was by Rahab’s scarlet thread. It is this simple philosophy of the ransom — a perfect human life for a perfect human life—that gives stability to our faith. How beautiful! How simple! Substitutionary atonement is the central doctrine of the Bible. “For since by man came death, by man came also the resurrection of the dead. For as in Adam all die, even so in Christ shall all be made alive” (1 Corinthians 15:21, 22). “For if through the offence of one many be dead, much more the grace of God, and the gift by grace, which is by one man, Jesus Christ, hath abounded unto many” (Romans 5:15). It is the very simplicity of the concept that speaks to its authenticity. Too good to be true? Too good not to be true! And yet our faith is sometimes weak. We need further support. The courtyard pillars, (amudim) were composed of three main components: The acacia pillars themselves, which were reinforced by silver bands, (chishukim); the copper bases, (adanim), into which the pillars were inserted; and the silver eyelets, (vavim), which were fitted onto the tops of the pillars, for stretching the curtains, (yeriot) across. “fillets” — Others have concluded that they were rigid, whether rods or bands, and served to stabilize the posts from leaning toward each other. We think that is correct. The Brazen Altar was the first item encountered in the Courtyard. It was five cubits square, and 3 cubits tall (Exodus 27:1). In each of the four corners there was a horn made from the same piece of acacia wood as the altar itself and the altar was over-layed with copper. The Brazen Altar was used to burn up sacrifices placed upon it, such as during the consecration of the priesthood and the Day of Atonement. Various utensils belonged to its service — fire pans (called censers), for carrying the fire to the ‘Incense Altar,’ basins to receive the blood, flesh hooks, shovels, etc. “Thou shalt put it [the grate] under the compass of the altar beneath, that the net may be even to the midst [Strong’s #2677: half or middle] of the altar” (Exodus 27:5). This placed the grate at the 1½ cubit mark, the same height as the mercy seat in the Most Holy. Both are considered in the design to be at the same “level;” neither towers above the other. A Christian recognizes that Jesus has been sacrificed for him and starts to recognize that a similar sacrifice is needed from him if he is to enter beyond the next door. The sacrifice we have to offer, is as the Apostle Paul expresses it, in Romans 12:1. Thus, the antitypical priesthood of this Gospel age are privileged to use this altar (Christ Jesus), in presenting their bodies “a living sacrifice, holy, acceptable unto God” for is it not the altar that sanctifies the gift? “You blind men! For which is greater, the gift or the altar that makes the gift sacred?” (Matthew 23:19). “Your sacrifice would not be holy and acceptable, but it is made holy and acceptable as such by the Advocate [Christ Jesus] imputing of his merit to cover your sacrifice” (“What Pastor Russell Said,” page 614). Presenting our bodies as “living sacrifices” to God includes all our thoughts, words and doings and doing the best we can in all we do to bring God glory, honor and praise. It is Christ Jesus, our antitypical High Priest who alone is able to offer up the antitypical sacrifices. All that the followers of Jesus do, therefore, is to present (consecrate, set apart) themselves, as pictured in the type by the goat’s being, tied at the door of the Tabernacle. “It is after Jesus lays hold of this individual, accepts his consecration, imputes His own merit, and offers him to the Father, that the Father’s acceptance is manifested through the Son… by the begetting of the Holy Spirit. Thereforth, such an one is a member of the Body of Christ, and his name is written in the Lamb’s Book of Life, from which it will not be blotted out if he maintains his faithfulness” (What Pastor Russell Said, page. 614). “It is the New Creature’s business to keep the old nature on the altar, upon which the great High Priest has put it. In other words, the New Creature must keep the old nature dead, hold it in subjection. When our flesh is brought into contact with the fires of experience for its consumption, it is the old creature that weeps, not the New Creature. Let the goat weep if it will. The New Creature will rejoice in the Lord and in His providential care, as daily it grows in grace and in knowledge. When the old creature is knocked out, or brow-beaten, as the Apostles says (1 Corinthians 9:27), it will groan; but the New Creature will be glad and rejoice in the Lord… We rejoice because God’s favor and blessing are with us as New Creatures.” (What Pastor Russell Said, page 613.) See also Acts 16:26, Philippians 4:4. Jesus allowed himself to be sacrificed for the entire world of mankind. He was perfect and became flesh to do the will of his Heavenly Father (John 4:34, John 6:38). The wood of the altar, typifying humanity, reminds us that Christ became a man for the express purpose of experiencing our infirmities and “to minister, and to give his life a ransom for many” (Mark 10:45). “For we have not an high priest which cannot be touched with the feeling of our infirmities; but was in all points tempted like as we are, yet without sin” (Hebrews 4:15). There is a thought that wood was used to make the articles of lighter weight and thus, more easily portable, than if of solid metal. This was an important consideration when they traveled. As discussed earlier in this series of “Beauties of the Tabernacle,” the use of copper represents the human nature in its perfection, a little lower than the angelic nature (unlike gold, which represents the divine nature, far above angels, principalities and powers). As gold and copper are much alike in their appearance, yet different in quality, so the human nature is an image and likeness of the divine, adapted to earthly conditions. “The Tabernacle’s altar of burnt-offering represents… the ransom-sacrifice of Christ Jesus (Tabernacle Shadows, page 22) — the ‘altar’ unto which the world of mankind in the Millennial age, will bring its sin-, trespass-, burnt-, and peace-offerings. (Tabernacle Shadows, page 95,96)” (“Notes on the Tabernacle,” page 134). The horns of the Altar of Burnt Offering were in themselves symbols of power; yet this power came from the blood which sanctified it. The Scriptures do set forth the fact that one guilty of a sin against his fellowman, when in danger of being apprehended, might flee for asylum to the altar — take hold of its horns, and find a safe refuge there (1 Kings 1:50; 2:28). “We too have an altar, the power of which stems from the blood of Christ Jesus, that sanctified it. We too, had sinned against our King, who could justly have destroyed us. But we fled to the altar and found sanctuary, an asylum, a refuge, there. Our faith in the precious blood, justified us — made us free as it were; but only on one condition could we continue to be free and that was that we covenant with our King thereafter to walk “worthily.” Having entered into this covenant we are safe from the “avenger.” But should the time ever come when we would break that covenant by profaning the blood of the covenant by which we were sanctified — outraging the Spirit of grace (Hebrews 10:29) — we would then fall directly into the hands of the “avenger” and be put to death — the Second Death!” (“Notes on the Tabernacle,” page 130). Some may question whether there was a ramp attached to this brazen altar which would assist the priests with getting the sacrifices onto the large surface area of the altar. “It is worthy of note that the Hebrew word ‘maalah’ occurring [here] in Exodus 20:26 and there rendered ‘steps’ in the KJV, according to Young’s Analytical Concordance to the Bible means ‘a going up, ascent.’ It would therefore cover even such a thing as a ramp, though this latter term has nowhere been used in the common version of the Bible. It has been rendered ‘stairs’ (2 Kings 9:13; Nehemiah 3:15; 12:37; Ezekiel 40:6; 43:17) and ‘steps’ (Exodus 20:26; 1 Kings 10:19, 20; 2 Chronicles 9:18,19; Ezekiel 40:22, 26, 31, 34, 37, 49). “No priests were ever to enter the precincts of Jehovah — the Tabernacle’s Court, Holy, or Most Holy — without the linen breeches ‘to cover their nakedness’ upon them (Exodus 28:42,43). Especially is the injunction given that Jehovah’s altar was not to have any steps (stairs or ramp) unto it, since an approach by way of such would necessitate the ‘lifting of the robe’ and the consequent exposure of the priest’s nakedness (Exodus 20:26)” (Br. Anton Frey, “Notes on the Tabernacle,” page 133). “The LORD spoke to Moses, saying, ‘You shall also make a laver of bronze, with its base of bronze, for washing; and you shall put it between the tent of meeting, and the altar, and you shall put water in it. Aaron and his sons shall wash their hands and their feet from it; when they enter the tent of meeting, they shall wash with water, so that they will not die; or when they approach the altar to minister, by offering up in smoke a fire sacrifice to the LORD. So they shall wash their hands and their feet, so that they will not die; and it shall be a perpetual statute for them, for Aaron and his descendants throughout their generations’” (Exodus 30:17-21). The Laver stood between the brazen altar and the door of the Tabernacle or “sanctuary”. It was a receptacle for water where the priests washed his feet and hands leaving behind the last traces of the flesh and of his contact with the surrounding world, before entering the Tabernacle. The Laver as a whole represented the Word of God, Jesus was the word who cleanses the believer through the washing of water by the Word (Ephesians 5:26). The Laver was cast from the mirrors of women who served at the Tabernacle, thus it was made of polished copper (Exodus 38:8) which represents the brightness of Jesus’ perfection. As the priests looked into the laver, they could see the faces reflected in its polished surface, so the consecrated see the imperfections and failings of their own characters when they compare these characters to the bright perfection of Jesus by looking unto him. The priests did not bathe in the Laver, but presumably drew water out of the laver using a copper pitcher for the purpose of washing his hands and feet (Exodus 40: 31, 32) — otherwise the water in the laver would become dirty. So we are greatly helped by concordances, dictionaries, etc. We cannot wash in them, but they help us in getting the Truth to cleanse us. And we likewise, cleanse our hands that they may do the will of God, and our feet that they may walk in Jesus’ footsteps, in the straight and narrow way. At this step an approaching Christian accepts this purification as did all the followers of Jesus. Even if the Master did not need any purification, since he was perfect and without sin, by washing the feet of his disciples Jesus showed another important element of that washing: humility. Now the Christian is at the door of the Tabernacle. After his journey through the Court, he is ready to follow his Master into the “greater and more perfect tabernacle” (Hebrews 9:11, KJV). Br. 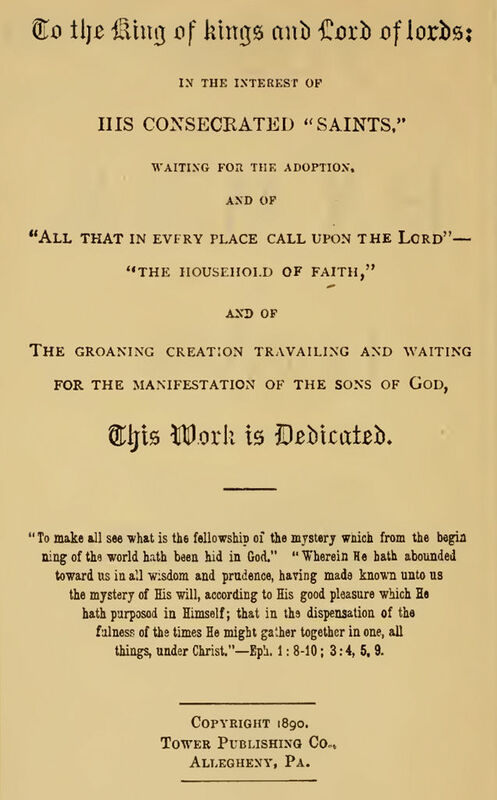 Charles T. Russell — for source material used from “Tabernacle Shadows,” “What Pastor Russell Said” (Question Book). Br. David Rice & Br. George Tabac — for sharing of content and editing for this post. The Temple Institute in Israel — for source material used. It is a tragic picture to contemplate. A perfect man, so unjustly convicted, dying in the prime of life. But his greatest defeat was his greatest triumph. That was why he came. That was why he left the heavenly courts to become a man in the first place. Note how obediently and willingly and humbly Jesus, the firstborn of all creation, the Bright Morning Star answered, when our Heavenly Father asked who should He send down to earth as the Redeemer, “Here am I, send me” (Isaiah 6:8). This is why the Son was the Almighty Heavenly Father’s delight. Father Adam caused the death penalty to be imposed upon the whole human family, Christ’s willing sacrifice provided the value to redeem all mankind. Only a perfect being who was separate from God could accomplish the task of removing the death penalty upon Adam and his race, thus providing a way for mankind to be redeemed from the power of the grave. Christ’s sacrifice provided a release from the curse, first for the Church class during the Gospel Age, and later for the World during the Millennial Age. God loves mankind deeply (John 3:16). We cannot imagine the sorrow and pain that God experienced when Adam fell. We can only get some idea of this feeling when we observe the grief of parents when their children go astray. God not only provided a mechanism to rescue His precious creation, but authorized His son to execute God’s plan for their redemption. “By his knowledge the righteous one, my servant, will justify the many, as he will bear their iniquities” (Isaiah 53:11, NAS). Not only did God provide the mechanism for mankind’s redemption, God also empowered this Righteous One, Jesus, to justify His chosen ones. “Wherefore Jesus, … that he might sanctify the people with his own blood, suffered without the gate” (Hebrews 13:12). Jesus was “delivered for our offences, and was raised again for our justification” (Romans 4:25). God has empowered His son to redeem us and justify us. The death of our Savior, Jesus Christ, provided the price of our release from the curse. The scriptures speak of the life of Jesus, given for us, as a “ransom” for us. Today we think of a ransom as a price for the release of a hostage. The scriptural word “ransom” is from the Greek word “lutron,” which literally means a price of release (Matthew 20:28, Mark 10:45). Jesus provided the price necessary to release us from the death penalty imposed upon Adam and his race. The object of the ransom was not to afford each individual a release from the original condemnation, in order to give them an opportunity to attain everlasting life. It allows mankind an opportunity to return to harmony and communion with God. (1) Determine the Price — The price of release (the lutron or ransom) was the value of a human life. God established that the punishment for sin was death, and this was imposed upon Adam when he sinned. Adam passed his condemned life to all of the human race. In order to release mankind from this penalty, would require an obedient man to accept that punishment upon himself, so that it could be released from Adam and all those who received Adam’s life through procreation. Thus every person who descended from Adam — all humanity — will receive a release from death. (2) Provide the Price — Jesus, as a perfect human being not subject to death, yielded his life in order to take upon himself, the penalty due us — so that we might be released. “By man came death, by man came also the resurrection of the dead. For as in Adam all die, even so in Christ shall all be made alive” (1 Corinthians 15:21, 22). Jesus’ life yielded, is the price for Adam’s life to be restored: Jesus for Adam, a perfect life for a perfect life. How beautifully they balance the scales of justice! (3) Pay the Price — When Jesus died, he said “Father into thy hands I commend [deposit] my spirit” (Luke 23:46). The word “commend” is from the Greek word paratithemi, which means to deposit as a trust. In other words, Jesus committed to God the value of his life for later use, and all of Jesus’ interests for his future work in the Plan of God. (4) Loosen the Captives — The world has been under the penalty of death, but they will be loosed (“luo”) from this captivity in God’s due time, when Christ and his “bride” of 144,000 members rules with him to raise and bless mankind. After Jesus was baptized, he meditated in the wilderness for 40 days. Part of this time he would have meditated on the Law of God, given to Israel through Moses at Mount Sinai. That law was perfect. Therefore, imperfect man could not keep it. As the Apostle Paul says in Romans 7:10, “The commandment, which was ordained to life, I found to be unto death.” For none of Adam’s imperfect race could perfectly keep the Law. But Jesus did. By keeping a perfect law perfectly he demonstrated that he was a perfect man, and therefore that he could be a corresponding price for the only other perfect man in history, Adam. Like an index finger, the law pointed out the one person who could pay the ransom price. Adam and Eve had no children until they left the garden of Eden. Therefore, all of their offspring inherited a condemned and imperfect life. Jesus, like Adam before he sinned, had the potential for a perfect human race in his loins. In this sense he was an appropriate value to redeem Adam and his race. Towering oer the wrecks of time. Be saved from Adamic death, from the destruction of the grave, to be accomplished through the GREATEST MIRACLE the world will EVER experience: THE RESURRECTION! Be saved from ignorance, blindness and deafness. Come under a “new covenant” established by God, during the 1000 year Messianic Kingdom. Be restored to perfection and an opportunity for eternal life. Come to a knowledge of God, and thus secure a relationship with God forever. The Ransom provides a salvation from the curse of death. It will be UNCONDITIONAL. It depends alone upon the will of God, and the price of release is the value of Jesus’ life, given for us all. This Scriptural passage, 1 Timothy 2:4-6, speaks of a universal redemption. During the Millennium the curse will be remitted. Then each individual may begin walking up the “highway of holiness” toward everlasting life. Most of mankind will accept this free gift, and progress accordingly. Only a few will use their power of choice differently, and fail to attain everlasting life at the close of the Millennium (Revelation 20:7-9). God will provide for the enlightenment of every individual when they awaken from the dead, so that everyone will have an accurate knowledge of God, His love, and His standards. The knowledge of Jehovah shall fill the earth (Isaiah 11:9). Mankind will have learned through experience the consequences of sin. During the Millennium, they will learn through experience the blessings of righteousness. All can then choose between the law of God which leads to life, and the law of sin which leads to death. Knowledge of truth is light, and Christ is “the true light, to lighten every man that cometh into the world” (John 1:9). Jesus is an Advocate and helper presently to those who have consecrated their lives to follow in Jesus’ footsteps. They express this commitment by baptism, and rejoice in hope of resurrection glory with Christ in heaven. We suffer with Jesus in the present, by pursuing righteousness in world surrounded by sin. We will reign with Christ in glory, to assist him during the Millennium in drawing mankind back to God (Revelation 20:6). During the Millennium, when God effects a new covenant for blessing Israel and the world (Jeremiah 31:31), Jesus will serve as Mediator, standing between God and men, in order to reconcile them by bringing mankind back to godliness. The saints who reign with Christ will be with Jesus in this mediatorial work of reclaiming mankind. Thus this work awaits the completion of the “Bride” class to be complete. Mediating for the world will then proceed. The saints will be associated with every feature of this work for the world, assisting them during the Millennium. The word Mediator from the Greek is mesite and means middle-man, reconciler, go-between. The Scriptures use the word respecting mediating a covenant between parties who are alienated. A mediator is one who interposes between persons who are at variance, with a view to reconciling them. Moses, as the Mediator of the Law Covenant, was a type of Jesus, the Mediator of the New Covenant. At the close of the thousand years the Mediator will have completed its role. Thereafter God will stand before God, and demonstrate, during the “Little Season,” their condition of heart. Those who are obedient and godly, will receive everlasting life. Those who are disobedient and rebellious, will lose this privilege. In 1 Timothy 2:5 we read about “The man Christ Jesus.” The Greek word for “man” is anthropos — human being. It refers to when Jesus when he was made flesh. Jesus “gave himself” as “the anointed” one (the word Christ signifies “the anointed”), who finished the giving of himself at Calvary. The name Jesus is but another form for Joshua, which signifies Deliverer. The name Christ is the Greek equivalent for the Hebrew word Messiah — The Anointed. Jesus surrendered his perfect human life, that is, all of himself, his human rights and privileges — the full equivalent of Adam’s perfect life. By his willing sacrifice for men he secured the right to purchase Adam and the entire race. He has not applied this human life to Adam and his race. It remains a deposit, for use at the appropriate time to release mankind from the curse. Christ was both Priest and Sacrifice. As a priest, he offered his sacrifice to God. As a Sacrifice, his human life was yielded up, given, for the benefit of mankind. As mentioned earlier, the ransom Jesus gave constitutes a price of release. Those who have come into Christ in the present time, accepting the value of his sacrifice by faith in him, are granted redemption presently. That is, God counts them as uncondemned, justified, by virtue of the value of Christ’s redeeming sacrifice (Romans 5:9). We then lay down this justified life in service and sacrifice with Jesus, as long as our days remain. We thus give up our share in the earthly blessings awaiting mankind, in order to secure the higher, heavenly blessings offered during the present time. The resurrection of Jesus was a testimony from God that Jesus performed his sacrifice correctly, and that all the blessings God has for us now — and the world later — are sure and established (Acts 17:31). Another evidence of God’s acceptance of Jesus’ sacrifice was seen by sending the holy Spirit upon the saints on the day of Pentecost. There God’s anointing, the holy Spirit (symbolized in the Old Testament by the holy anointing oil), came upon the Church. It continues ever since on all the living members of the Church. Jesus laid down his life as a sin-offering during the 3½ years, and Jesus applied the value of this for the Church class when he appeared in the presence of God for us. Jesus has not yet applied it for the whole world. That awaits the Millennium. The ransom price that Jesus gave provides a release from condemnation, for us now, and for the world later. That was given on Calvary’s cross. The sin offering that Jesus gave began at Jordan (when Jesus was 30 years of age), and continued through the 3½ years of Jesus’ ministry (until Jesus was 33 1/2 years old). Jesus was “made perfect,” or complete, in character, “by the things which he suffered” (Hebrews 5:8,9). Jesus was not imperfect at any time in the sense of being sinful (2 Corinthians 5:21, 1 John 3:5, 1 Peter 2:22). He was perfect, undefiled, in His glorious condition as the Logos, before He left the glory which He had with the Father and was made flesh. When born of Mary, the assurance given us is that He was still “holy, harmless, undefiled and separate from sinners” (Hebrews 7:26). His sufferings, therefore, did not make Him perfect in the sense of making Him sinless, but rather, to prove his loyalty to the Father’s will, unto death, even the death of the cross. The promise of perfection on the highest plane — the promise of the Divine nature — was Christ’s reward for fulfilling his Covenant of Sacrifice faithfully and loyally. The beginning of that new nature was granted to Jesus at the time of his baptism, when he was begotten of the holy Spirit. But the new nature begotten there needed development, or perfecting; and it was for this purpose that the trials, difficulties and buffetings were permitted to come to Him (R5472). As our High Priest in glory, Christ — our Advocate (our personal “lawyer”), works with us through our experiences, to purge from us the propensity for sin. The Church is not a part of the ransom price. However, we do have the privilege of suffering with Christ presently, and being raised in glory to be priests for the world during the Kingdom (Revelation 20:6). From that elevated standing, we will be able to assist Jesus in purging from mankind their propensity for sin. In this way we share with Christ in being an offering for sin. The Church is not a part of the ransom price but does share in the sin-offering through grace. These two doctrines are inseparable. We could call them the TWIN DOCTRINES as they always work together in the process of salvation. The ransom expresses God’s justice. For it shows that a payment for sin is necessary, in order to release mankind from the curse justly imposed upon our father Adam in Eden. But as steadfast as the penalty has been — so God’s commitment to release mankind from the curse, now that a payment has been made, is equally sure. Christ has already redeemed mankind in the sense that he has laid down the ransom price. But he has not yet rescued mankind and applied to them the value of the ransom price provided. That awaits the Millennial Kingdom. In the meantime, God is selecting from among mankind people of faith, to be developed in the pattern established by Jesus, in order to assist Jesus in the world of lifting the world from their plight during the Millennium. Then God will apply the price of release for Israel and the world. Then a New Covenant will be established for blessing of all who come under its blessings. When the Millennial age shall have been finished its work, and all are restored to harmony with God, then our heavenly Father will be ALL in ALL (1 Corinthians 15:28).